Brakes secured their second away win of the week last Saturday as they overcame Slough Town in difficult conditions at Holloways Park, writes Paul Edwards. Both sides were unchanged from midweek away wins as they looked to push towards the top five and despite rain falling steadily in Beaconsfield for some time prior to kick-off, there was never any danger of the game joining the division’s four other postponements. 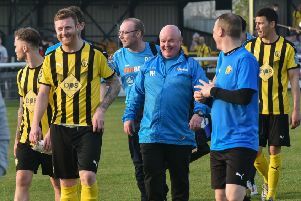 Lee Barney sent the first shot of the game safely into the arms of Tony Breeden from the edge of the penalty area, while Lewis Putman curled a free-kick around the Leamington defensive wall but wide. Courtney Baker-Richardson was first to threaten for Brakes, turning past marker Sean Fraser only to drive just past the post. Rebels defender Paul Stonehouse was sent off against Brakes in a heavy defeat for former club Oxford City last season and his Leamington nightmare continued when he put them ahead in the 14th minute, turning in Ben Mackey’s driven cross while under no pressure. Slough threatened an instant response from a long throw but Breeden was alert and dived to smother Barney’s shot. The striker then almost got in on the right, but slipped at the crucial moment and the ball rolled out of play. Mackey came close when he drove a good effort just over from distance, while Lee Moore saw a shot blocked after a good cross from Connor Gudger. Leamington were doing the majority of the pressing, Sam Austin breaking into the box but narrowly failing to find Baker-Richardson with a lofted pass. Barney was still the main threat for Slough and he saw a first-time shot held by Breeden. Moore then got in behind Stonehouse at the other end, forcing a save from keeper Mark Scott, who palmed Leamington’s first corner of the game away from his goal as the first half drew to a close. Slough came more into the game after the interval and were level just past the hour-mark, Ed Smith capitalising as Jamie Hood stretched to make a clearance, driving into the box and picking out Warren Harris who connected with a firm close-range header. The home side were almost in front moments later, Richard Taundry clearing an acrobatic effort off the line from Guy Hollis following a corner. The pitch was becoming sticky due to the incessant rain, and Mace had an effort that seemed to stick in the mud before heading straight at Scott from a free-kick. Austin then tested the goalkeeper from distance, Scott claiming the ball at the second attempt. The rain eventually relented but the mud aided Leamington as they regained their advantage with ten minutes to go, Rob Ogleby scoring within minutes of replacing Mackey.The substitute chased down a back-pass from Stonehouse, winning the race to nick the ball past Scott and tapping into an empty net. Ogleby forced another save from Scott, the keeper saving with his legs at the expense of a corner after a swift counter. A good run from Lewis Putman set up Scott Harris, whose shot was held by Breeden but Leamington sealed the points in injury time when they broke again. Ogleby looked to be heading towards the corner flag but instead opted to play in Austin, who rounded Scott to score his first goal for the club. Slough Town: Mark Scott, Sean Fraser, Paul Stonehouse, Guy Hollis, Dan Hicks (Jake Parsons, 85), Ryan Hope, Lewis Putman, Nathan Webb, Lee Barney (Scott Harris, 74), Ed Smith, Warren Harris. Subs not used: Jhai Dhillon, Gurkan Gokmen, Leigh Rumbold. Brakes: Tony Breeden, Richard Taundry, Connor Gudger, Joe Magunda, Jamie Hood, James Mace, Lee Moore (James Fry, 94), Jack Edwards, Ben Mackey (Rob Ogleby, 76), Courtney Baker-Richardson (Ross Oulton, 85), Sam Austin. Subs not used: Ben George, Jamie Tank.